Our new after-school Community Literacy Lab. The question is posed by a child in Year 5 as she puzzles over a comprehension exercise. The text is taken from JRR Tolkein’s The Hobbit and it’s the part where Bilbo encounters fearsome treasure-hoarding dragon Smaug. Some of the vocabulary is proving tricky so Graham, her tutor, steps in to help. “Dimly? It means the light there is not very bright. You can see, but only a little bit,” he explains. As part of our new after-school Community Literacy Lab at Turnham Academy, a number of pupils from Year 5 are receiving extra support for their literacy learning, with comprehension and language identified as key areas to focus on. It has all been made possible thanks to donations from The Big Give Christmas Challenge 2017. The Literacy Lab opened its doors in April 2018, with spaces provided to children for free. As well as comprehension exercises, the mix of activities includes open-ended philosophy questions, linking to the Philosophy 4 Children (P4C) programme followed by the school. “Philosophical questions invite open-ended discussion, promoting the speech and language skills that form an important part of person’s overall grasp of literacy,” explains Adam Wisden, Schools Programme Manager for The Children’s Literacy Charity. For example, in a recent exercise children were given a range of housing options and a list of people with varying needs. The challenge was to consider who should live where and why. With no right or wrong answer, the children were invited to employ deductive reasoning skills, arguing the case for their choices. While table-based activities take place in a classroom, the stories and games part of the Literacy Lab happens in the school’s library. It’s a calm and inviting space with coloured beanbags and wooden book ‘huts’ draped with cloth where you can curl up on a cushion with a book. Among the Year 5 pupils who attend the Literacy Lab, a series of staged books featuring Marvel super-heroes by Dorling Kindersley is super-popular. Children and volunteers share stories together, pausing to discuss the action. 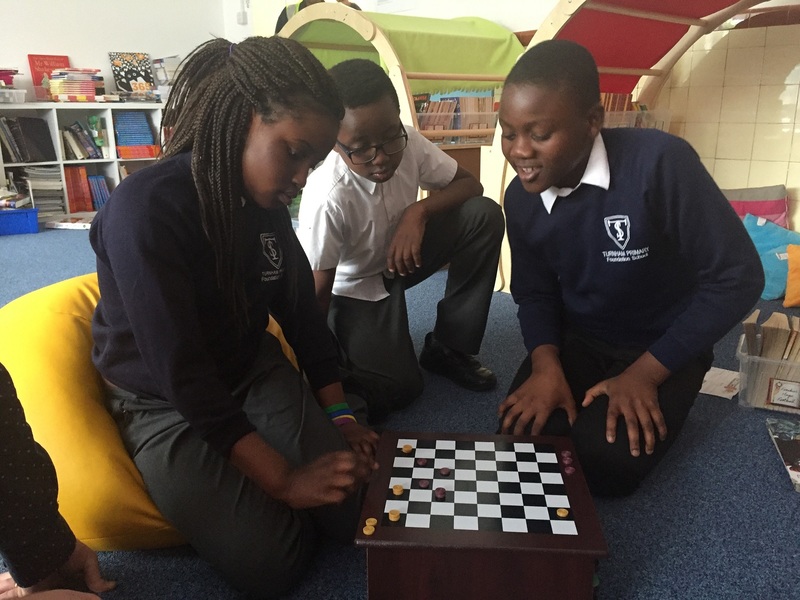 During the games time, there are opportunities for developing language and critical thinking, with classic board game draughts proving a surprise hit. Adam explains, “Draughts is a great game because it promotes strategic thinking and planning ahead.” It’s a fun and relaxing time that children look forward to – and it plays an important role in helping them develop the power of perseverance as learners. Adam is a tough opponent – and it’s deliberate. Helping children to become confident and engaged learners is at the heart of what we do as a charity. We’re excited to see what’s happening at Turnham, and hugely grateful to everyone who donated to The Big Give Christmas Challenge 2017 for making it possible! Could you donate to The Children’s Literacy Charity and help us support more children in more places more often?